A free pattern featuring baubles hanging from the words “Merry Christmas” has been added to the PinBroidery collection. www.pinbroidery.net/product.php/107/ The pattern size is 152 mm x 104 mm (6 x 4½ inches). This week’s card is called Merry Christmas and was made by Nette. 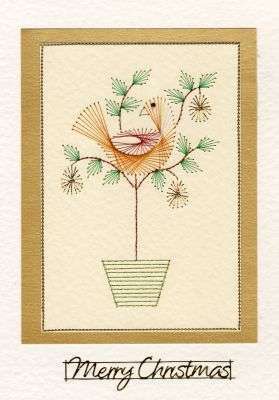 This attractive card was made using the PinBroidery Partridge in a pear tree Rt Pattern. It is stitched on cream card then mounted on gold card and white card to create borders. 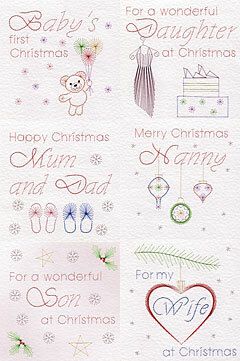 Six Christmas patterns have been added to the Pinbroidery stitching card collection. ‘Baby’s first Christmas’ alternative greeting for Birthday. ‘For a wonderful Daughter at Christmas’ alternative greetings for Sister and Niece. ‘Happy Christmas Mum and Dad’ alternative greeting for Mom and Dad. ‘Merry Christmas Nanny’ alternative greeting for Grandma. ‘For a wonderful Son at Christmas’ alternative greetings for Dad and Husband. ‘For my Wife at Christmas’ alternative greetings for Mum and Mom. The patterns are available individually and in a value pack of all six designs. 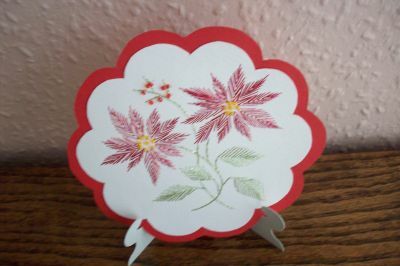 This week’s card is called Poinsettia and was made by Sparkle. This beautiful card was made using the PinBroidery Poinsettia Pattern. This week’s card is called Violet easel card and was made by Liken. 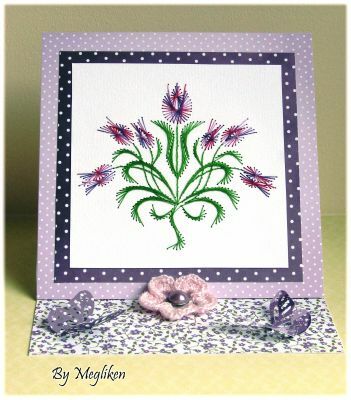 This exquisite card was made using the PinBroidery WM-4-Tulips Pattern.